Super Bowl Food Tips | Holidays and Observances - Can You Eat Healthy? Super Bowl Food and recipes abound! Packaged chips, high fat dips, "Little Smokies," and any other high fat food that catches your eye is a must! You’ve been doing a great job with your New Years Diet Resolutions, but rules are meant to be broken! Not so! There are many delectable snack ideas worthy of a Super Bowl party that will delight everyone! Who wants the Monday morning food coma hangover anyway? As with any other big Holiday meal plan, a great Produce Tray filled with lots of seasonal fruits and vegetables and home made dips, will go a long way! The more great foods you eat, the less room for all the Super Bowl Snacks that are available! I always have to laugh, because for every family party that I've ever attended, I've never been allowed to bring anything except for a Produce Tray, as everyone eagerly awaits what I will show up with! Avoid store bought dips. Be sure and check out the calorie counts. Most dips are very caloric, and most of you will eat many servings of dip; maybe an entire day’s calories. Make your own if you have to have them, with healthier ingredients! Avoid large bags of chips, chips, and more chips. Avoid appetizers. They are calorie laden and small. It takes a lot of them to curb hunger. Avoid serving food by your television to avoid mindless eating. Watching television and eating is a deadly combination for overeating. Avoid serving a huge variety of different types of foods. Indecision causes overeating. Avoid nuts, even though they are healthy. They are so caloric and so easy to grab and overeat. Avoid desserts. Everyone is always so full from overeating that desserts are not appreciated. Avoid purchasing high calorie processed foods. Check out the calorie counts. If they are caloric, slowly put them back! Your friends will thank you. Avoid purchasing giant Costco bags of appetizers. You will be forced to eat them later on if there are leftovers. Pictured above, was my favorite Super Bowl Food picture that I found on Pinterest! This would be pretty easy to make, although it is harder to find great watermelons during this time of year than in the summer. Having some healthy options like fruits and vegetables, and a crockpot full of soup or chili, is the way to go! Start your guests off with a bowl of healthy chili, or soup to fill them up. Check out Kerry's Healthy Recipes on her Healthy Diet Habits website for some great ideas! (She has some great Soup and Chili Recipes) Her Slow Cooker Chili Recipe is a great choice for the day! Serve chopped vegetables with a light dressing as a dip. Serve a home made salsa full of chopped fresh vegetables. Serve large chopped vegetables as your dippers rather than chips. Serve fresh fruit kebobs or grilled vegetable kebobs. Serve oven roasted vegetables for appetizers. Serve whole grain breads, and lean nitrate free sandwich meats. Choose artisan breads that are so much better. Serve air-popped popcorn spritzed with olive oil, and sprinkled with a bit of fresh parmesan cheese. Serve food in your kitchen. People will eat less if it is not right in front of them. Serve a yogurt bar with fresh fruits, nuts, granola, and dried fruits, if you are offering dessert, or serve up ready made sample sizes like pictured below. 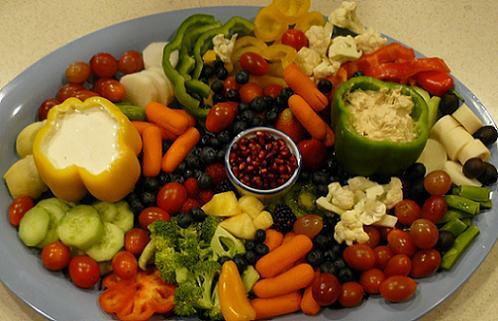 Your Super Bowl food should be colorful; full of fruits and vegetables rather than colorful chips! Stick with fresh real foods that are not processed, and you will feel a whole lot better on Monday! 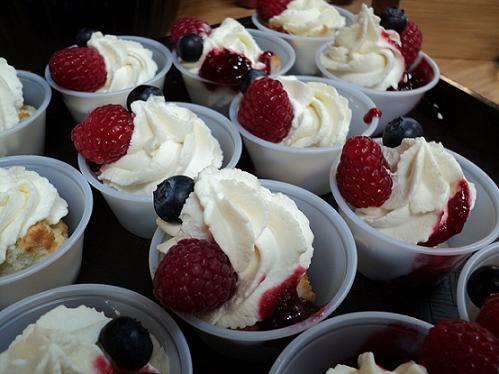 Throw in a small piece of Angel Food Cake, whipped cream or Cool Whip, and a few pieces of fruit in small plastic cups that are pre-served, as an option if you want to serve a dessert! You can use similar cups to serve single serving Dips as well. This dessert also works well for your Fourth of July Meals! Below is a sampling of our Holidays and Observances Super Bowl Sunday Food Holiday Board on Pinterest - you will see our 30 most recent pins to this photo board! If you want to see more of the photo's, click on the SEE ON PINTEREST bar at the bottom of this board, and it will open up a new browser window, so you can follow this board. Click on the SEE ON PINTEREST bar right above, to see all the rest of our photo's on this board, over on Pinterest (Pinterest will open up in a new browser window) and to Follow the board. New photos will be constantly added!